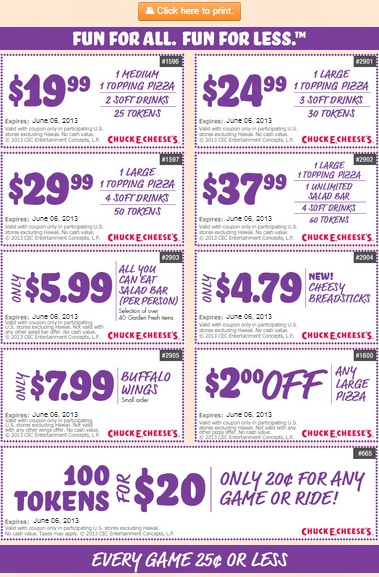 Here are some of the latest deals from Chuck E Cheese. The other coupons are still good, but Here are some different options to choose from. This group offers some wing deals, and also the all you can eat salad bar (my FAV) and cheesy breadsticks coupons. Always a special at Chuck E Cheese. 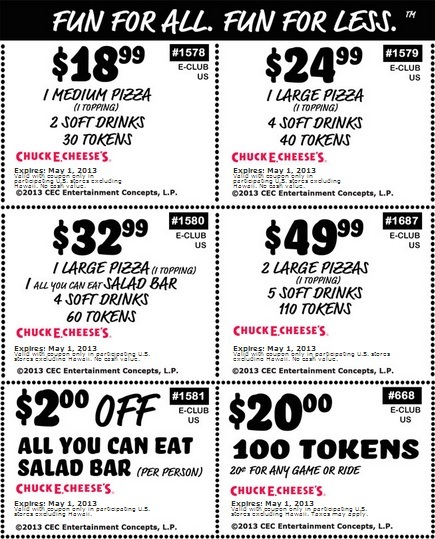 Whether you have coupons or not, it’s always a treat for the kids to go to Chuck E Cheese. They have the best time there as always. It’s a safe environment and a great meeting place for the parents as well. With so many games for them to play, they will go through 100 tokens quickly, so you will be happy to have this coupon! Click the coupons to print. Why wouldn’t anyone take this offer! this is great! Chuck E Cheese’s has got to be the most fun for birthday parties around. For a limited time, you can get a HUNDRED bonus tokens when you reserve your party for a Friday or a Sunday! They cater to not only the kids, but they also know how to take care of the adults during the fun time for the kids. Take advantage and book today at a participating location near you. There is no coupon necessary for this offer. Just go through the link. When you want to take the kids out to Chuck E Cheese’s, it can get a little costly at times, because they want to pack as much fun AND food in one visit as possible, but they are understanding! They often offer plenty of coupons for your visits! Here is the latest coupons that they have for you to enjoy with the family and friends without that added stress.. 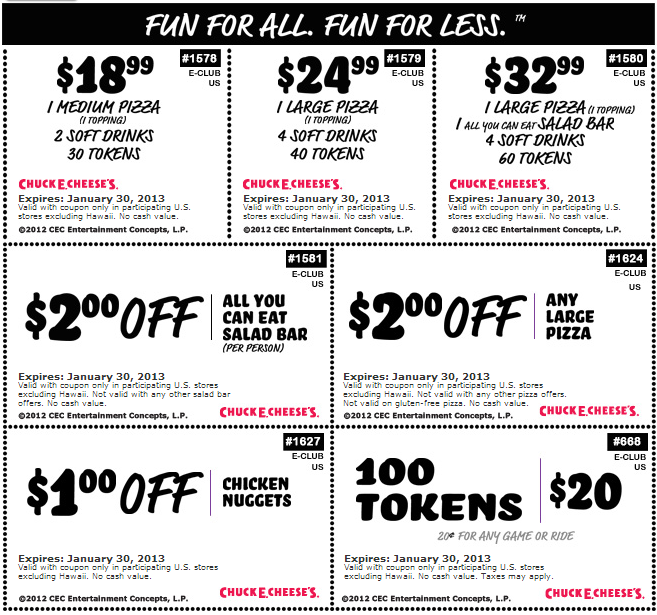 They offer many different deals on the Pizza combinations that you will need, with the soft drinks and tokens as well! There’s even a coupon for the salad bar. These are great savings. $20.00 for 100 tokens!!!! WoW!!!!!! Print these coupons out and get these deals before May 1st!! AND you can play online games at Chuck E Cheese and win FREE tickets! Chuck E. Cheese is a blast for all the kids! Fun fun fun all day long! All the kids love to play at Chuck E. Cheese and here are a ton of deal that are good all through March 27th. Food and games combined will make their day, and yours as you take them out for a fantastic day of fun and activity. Grab a bunch of your Mom friends and get the kids together for an afternoon. The kids are very entertained in a very safe environment every time you go to Chuck E. Cheese’s. They have the kids favorite foods too. 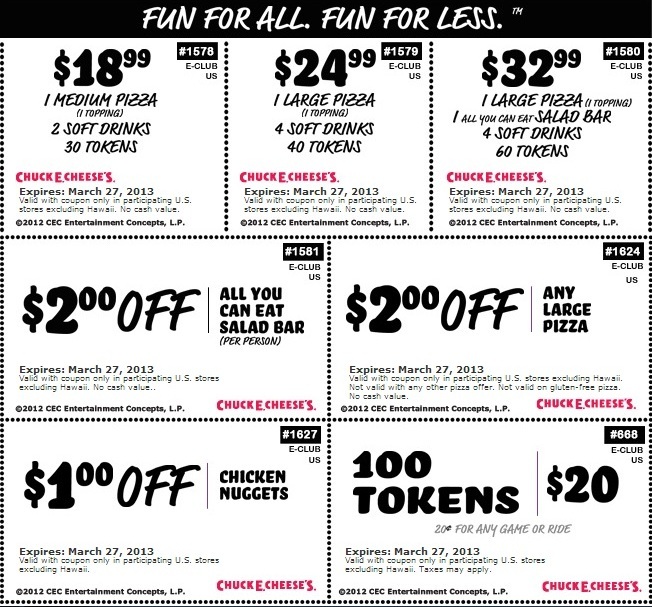 Print these coupons for food and tokens to save before March 27th. Have fun!! !